This article was found on the excellent London Ancestor website. It is taken from a newspaper cutting, source and date unknown. I have sent you a photo taken from Roques’ Map of 1741, thinking it might interest your readers and elicit some information from others of the names of places that have passed away. 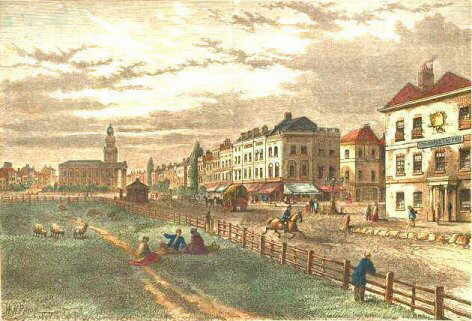 Beginning at Newington, Allen, writing in 1826, says, “Along the road to Kennington-common, on the right, in a very large house situated at a place where now the end of York-row and Pleasant-row meet, dwelt Lawrence Whitaker, Esq., steward of the Manor of Kennington in 1636, and a member of the Long Parliament, which house was afterwards divided into tenements and called Kettleby’s Rents. It has long since been pulled down, but the name is retained to a row of small houses.” The rope walk opposite, with the Goter Farm, bespeak the rural aspect in 1740. The Manor House, Walworth, afterwards the Surrey Gardens, is shown. 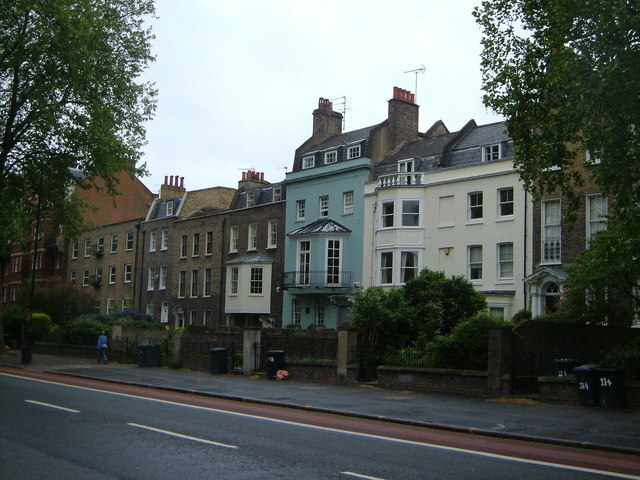 Along the Kennington Park-road, upon the right, may be seen over one of the houses, on a stone tablet, “Clayton-place, 1785.” This, as also the street of like name, is from a former leaseholder, Sir William Clayton, of Harleyford, Bucks, hence also the name of Harleyford-road. After passing the Horns Tavern, which in 1776 was patronised by a City Livery Company which even that time must have catered well for visitors, for I find the same Company repeating their visits in 1788-1789 and 1793, looking a little further on I find depicted the gibbet where, in 1746, many of the friends of the Stuart faction paid the penalty of treason, among whom were those who commanded the regiment raised at Manchester for the use of the Pretender. Allen, in his “History of Lambeth,” shows the swivel found, which was used to fasten the culprit to the gibbet. Beginning at Vauxhall end of the South Lambeth-road, I will endeavour to recall the houses and their inhabitants that I remember during my ambulations of over forty years. First, looking at the course of the Effra, which after rising among the Surrey Hills flowed across Camberwell-lane, distinguished in the Brixton-road as the Shore, across the Clapham-road, through meadow-land, down Lawn-lane, to Vauxhall. At Vauxhall still remains a fine old house with a staircase worth the antiquarian’s notice – I mean the house now occupied by Mr. Richardson; the handsome iron gate at the entrance should also be observed. At a little distance from here, Ducarel mentions a fine spring called Foxhall well. “The water is esteemed highly serviceable in many disorders of the eyes, and in the hardest winters is never known to freeze”; this well I remember seeing at the side of the “Stags” public-house. Returning to South Lambeth, the houses upon the lawn now Vauxhall Park is shown, and Bond-green is marked upon the map (this must have been the property of J. Bond, Esq., of Mitcham, who, Allen tells us, granted a lease in 1794 of the ground upon which the Church of St. Ann[e]‘s now stands – hence also the name of Bond-street). South Lambeth Bridge is interesting; I remember seeing only a few years ago, at 218, South Lambeth-road, one of the arches forming part of the bridge still remaining. It may be remembered that the bridge was opposite the grounds of the Tradescants, and Mrs. Tradescant is said to have been found drowned in her pond. (I may here remark that Mrs. Tradescant left £50 to the poor of Lambeth.) Adjoining Turret House was Stamford House, the residence of another South Lambeth worthy, Dr. Ducarel, the Lambeth historian, who died here 29th May, 1785; the last resident was a Mr. Hay, a genial schoolmaster, who formed a small museum for the instruction of his boys; next to this came a very old house with diamond paned windows, called Meadow House, occupied forty-two years ago by a family of the name of Austin; these houses have all long since disappeared. Near this spot was the dwelling of the Rev. Mr. Horsley, a venerable Baptist minister; this was taken down to make Heyford-avenue. Mawbey-street stands upon the site of Mawbey House, recalling to mind Sir Joseph Mawbey, Sheriff of Surrey, 1757, M.P., and knight of the shire. Dean’s-place, commencing at the corner of Thorne-road, was so named from the Dean and Chapter of Canterbury, who possessed land here (this is now 224 to 244, South Lambeth-road). Near here was Montpelier Lodge, some time the residence of Sheriff Twentyman, and Montpelier House, where lived Dr. Watson, Head Master of Stockwell Grammar School and translator of several classics. Poddes-lane-now Lansdown-road and Priory-road is a name quite forgotten, as is also Babilon, near the Bedford Arms. Why was it so called? Ducarel’s “History of Lambeth,” 1782, states that the Duke of Bedford has a small estate at and near Stockwell; thus the name of Bedford-road. I must now say something about Stockwell. Entering Stockwell-road from the Brixton-road, on the left were two large mansions standing in their own grounds, which I think must he the ones marked upon the map many years ago (the first was occupied by a Mr. Gibbs, the second by Mr. Pilcher, and a third, in 1869, by a Mr. Silva); Walnut-tree House (Mr. Woolner), Boxley House (Mr. Moses), Blakesley House and Villa (where the Board school now stands) dwelt respectively Mr. Appleton and Mr. Pewtress. The house and grounds of the eccentric John Angel is well marked on the map, occupied in 1861 by a Mr. Shakespeare. I remember at its demolition, some years since, being shown the powder-room, where, in Georgian times, the coiffeur duly dressed the ladies’ hair. The next house of note upon the right was the “Old Queen’s Head,” long since rebuilt, but in my remembrance a comfortable old hostelry; near here was Bryan Barrett’s house, which was built upon the site of Thomas, Lord Cromwell’s, but had in 1861 long disappeared; the old house, Ducarel mentions, having had a moat some thirty or forty feet wide round it; the name is still preserved as Moat-place. Fern Lodge, the residence in 1862 of Carl Haig, the celebrated artist, still stands. Having had occasion several times to call upon him, I have often waited on a hot summer afternoon in one of the rooms which was panelled and hung with cartoons, the furniture in oak being carved, the floor heavily carpeted, and while waiting and hearing the sheep bleating upon the green (which was at that time open ground), and almost dozing in one of the artist’s comfortable old-fashioned arm-chairs, have fancied I was in one of the old German houses that one frequently meets in the German cities, and to complete the picture, when the courteous master of the house appeared in velvet coat, have imagined that one of the old Dutch burgomasters had stepped out of a Vander Helst canvas. Next to his house lived a Mr. Cross, and this was the place famed for the Stockwell Ghost. Opposite Love-lane stood another old mansion, where at the sale of building materials some years since I noticed a curious marble closet. Many of these old houses had remarkable mantel-pieces – some, I have no doubt, from the studio of William Collins, a celebrated artist, the friend of Gainsborough; his chimney-tablets mostly exhibited pastoral scenes. The knockers of these houses have also attracted my attention. The “Swan” at Stockwell, rebuilt over forty years ago, and about that time famed for its select whist parties, will conclude my ramble. – OLD MORTALITY.